I’m honored to announce that I’ve been chosen to become a Salesforce MVP today! I still remember, years ago, looking up to the Salesforce MVP class – dreaming that maybe if I worked hard enough I could one day become one too. Even at this moment I still wonder if I am dreaming. If you’re a Salesforce dreamer like I am, I hope my story can be an inspiration to you too. I am not super intelligent, I didn’t go to a good college, and I was never lucky enough to be “gifted” with any jobs or positions. I am your average man who still believes that if you work hard you can accomplish your dreams. I hope my site helps you guys believe this too. Email me at dvdkliu+sfdc99@gmail.com if you want to share your story with me! Syed Talha whom I consider to be my career mentor. Syed is the most passionate Salesforce user (now employee!) I’ve ever met and simply being around him makes me believe that anything in the world is possible. When I met Syed he guided me throughout my career and asked for nothing in return. To me he embodies the purest good in this world and I hope to capture even a fraction of that in Sfdc99. Thank you Syed! Titu Bhowmick, who was the first programmer I ever officially worked for. I asked him so many dumb questions but he always helped and never gave up on me. I didn’t know if it was possible for me as a marketing major to learn enough code to make a career out of it, but Titu insisted that I could do it if I applied myself. Even as a programming genius he never looked down on me and instead treated me as an equal. I hope when I answer the questions you guys send to me, that I can be as good as a person as Titu. Brian Sohmers, who not only let, but encouraged me to switch from the marketing to the engineering department in my first job at Equilar. I had done nothing to deserve this favor but Brian put his faith in me and let me pursue my dreams. I still remember sitting by him on the airplane studying Head First Java. Brian I hope one day I can become a great leader like you. My mom, who supported my decision to risk my career and pursue a programming job – during the worst year of the worst recession of our lives when I already had a stable job in marketing. She has always been a proud and loving mother even when I have not been the ideal son. I love you mom! My fiance, who lovingly sat by my side as I spent my nights and weekends working on Sfdc99. You, the Sfdc99 reader! I know many of you voted for me and I would like to thank you for taking the time to do so, even when there was no incentive for you. I hope to not only instill in you Apex techniques, but also the belief that you can accomplish your dreams too. A lot of people ask – these are the benefits of becoming a Salesforce MVP! 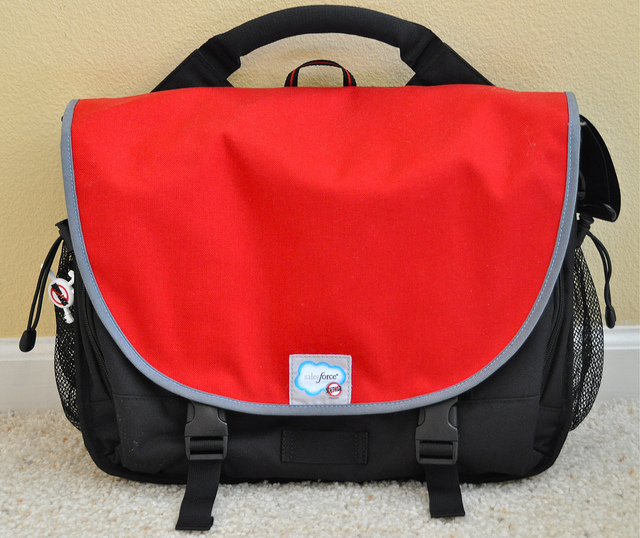 It may seem a bit silly, but one of my favorite prizes is the free Rickshaw laptop bag! Congrats David on becoming Salesforce MVP. I am working with salesforce since last 5 years . I am very good in programming but I am still confused what to do next? What path should i choose to enhance my career. Can you pls guide me how to do and where to start? Congrats for your Huge Success. Honestly I am little disheartened because Even after reading and learning a lot. I am still not sure how to start coding.. I am trapped in a delimma of what to do and how to start.. I need some examples on apex and some scenarios to practice a lot and to build the logic. Your site is really helpful and you are now my new Love for programming role model. Moreover. Your Certifications are just like a bench mark for someone who wants to get there.. how did you achieve such a huge success in such a short span of time. I am sure there is lot of extra hours you spent and a lot of football games and parties that you have missed to get there. Need your help and guidance for examples and scenarios. Hope to hear from you soon. Stay Blessed. Have you tried the Apex Academy? I made it specifically for your use case where you prefer higher touch! I’m very hardworking but honestly I’m more lucky. I’m lucky I was born here, raised near Google, etc etc. I do work literally every single day though, even if it’s just a little. Imagine not having a day off in years! P.S. email me about the Apex Academy! Man of Value. Thanks Bro!.Congrats. As someone who is relatively new to Salesforce, you hear lots of phrases like MVP and Trailblazer, but what exactly does it mean? How do you become an MVP or a trailblazer? What does it mean for you and the wider Salesforce community? I was trying this trigger but when I tried creating a record in Opportunity it shows “OpportunityTrigger: execution of AfterInsert caused by: System.TypeException: Invalid decimal: opp.Plan_Number__c: Trigger.OpportunityTrigger: line 10, column 1″. Can you suggest something. It’s not about how you know but how much you want to do. Even the greatest of all did not make it in the first go. It’s all about how you did it David. Kudos ! I have been lurking around on sfdc99 for a while and today stumbled upon this page. I am so touched by your story and right now thanking all the people in my heart who helped me reach where I am. I come from a very humble background in rural India, worked throughout my education since school days in my father’s small business and later independently. Never thought I would be able to finish college because of family business pressure. But here I am, finished my education in India (non-english and non-fancy) and got a job there first in programming. Later found a job in USA and have been working for State of Indiana for last 8 years as Java/ Oracle/ SQL server developer. I have a natural knack for selling and marketing but technology is my first love. For last several years I have been seeing the declining trend in traditional programming and feel like Cloud is where the world wants to be! I picked up Salesforce by self motivation and got my salesforce 401 certification last year. Currently working on some small side projects and after gaining some more experience, I will make a permanent switch to Salesforce. Just wanted to thank for sharing your learnings here and making people like us welcomed, who know how to code but don’t know where to start. Keep up the good work and hope to pick your brain someday on some tricky situation. I follow you on Twitter too and really enjoy your posts. Thanks and take care. This comment goes in the Hall of Fame! Thank you for your kindness and I hope your switch to Salesforce is successful! Would love to have you do a guest post on the transition if you’re interested! Email sent! Thank you Ashish! “Purity,patience and perseverance are the three essentials to success and above all is love “- Swami vivekanada . Liu – You succeeded because you had maintain above 3 qualities and more over you fell in love with Coding particularly with Salesfoce !!! Your story is inspiring!! Great words, thank you Rama! You can accomplish anything with hard work and perseverance! I am newbie in the Salesforce world and wanted to thank you as your tutorials are really helpful and your blog is inspirational. Right now on the path of “Work hard, work smart, get certified”. 401 by end of this month and 501 by end of this year is the target (hopefully!). Also, wanted to wish you congratulations for the MVP (bit late though.. but then i just got to know :)) and the recent news of teaming up with Salesforce for the official Apex series. Wish you all the best! Thank you Rajiv and best of luck on your certifications! Nope – but I’ll definitely make a post if I knew of one! Vivek you know I think you’re awesome too! David – that is an amazing achievement. I am on the same path as you trying to achieve becoming an MVP. Your story is very inspiring. Thank you Jeff! So happy that this can be an inspiration for somebody!! Happy to pass on any of the knowledge that I was fortunate enough to have passed on to me =) Let me know if you have any questions! Congrats and welcome!! And yes, the bag is epic!